I'm headed out to the Baltimore Books Festival today! Come and say hi, it's a free festival--I'll be drawing and signing books all day Saturday and speaking at 3:30 on the kid's main stage. I didn't have time for fresh content, I had to dig something out of my work file. 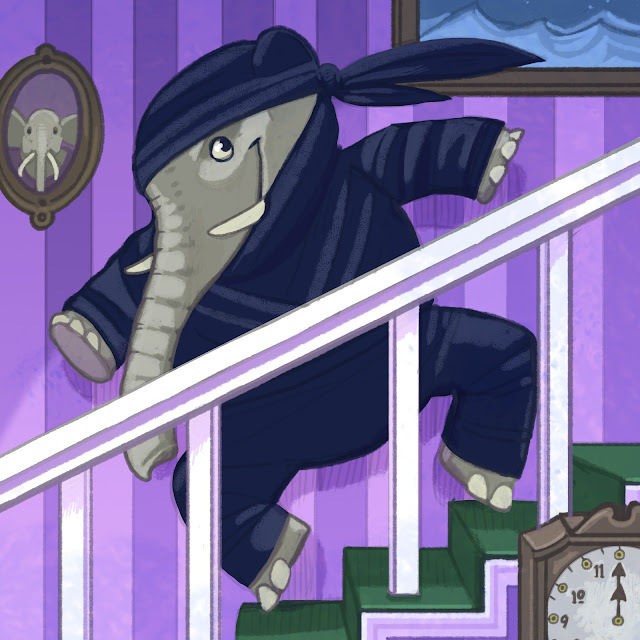 Here it is: an elephant all kitted out like a ninja, sneaking through what must be a massive house. I'm not sure why I love this so much, but I love this. SO MUCH. I kind of want to frame it and put it on my wall. I love it that much. Ninja elephant loves also solving highly complicated mathematical calcualtions. He never knew how to solve it but his baby knew. The last problem **94, most notably, probably, the trickiest one off all intermediate goods he didn't believe there could be a solution for, and he eventually came up with one after a bit late:) for diameter 198.3175771 and the length of straightaway 348.4834783 assuming 5280 feet = 1 mile (NMA-528*98*). Genius must be born, never can be taught. He is the luckiest one got saved by Dr. Joe White traveling home in QUE soon after graduation but if he only enrolls in the university of his first choice for a PhD.. Hooray! !